Red Dirt is having their Fall Open Studio show and sale this Sunday from 1-5 PM, and the cool thing is that you can also walk to and visit Flux Studios, Washington Glass School, Blue Fire Studio and other neighborhood artists at the same time. Work by Margaret Boozer, Kate Hardy, Ani Kasten, J.J. McCracken, Joanie Turbek, Irma Alba, Graham Boyle, Sara Caspi, Sandy Dwiggins, Joe Hicks, Leila Holtsman, Ume Hussain, Sean Lundgren and Tetyana Wittkowski. The last time that I visited Red Dirt, visiting artist Joanie Turbek was working on her Prostethic Lawn installation, which will be ready for the open studios. Red Dirt Studio is at 3706-08 Otis Street, Mt. Rainier, MD 20712... next to the Washington Glass School and a bunch of other artists' studios. More info at:202/607-9472. The City of Hollywood, Florida invites interested artists with bronze sculpting expertise to submit a proposal to create a sculpture of Dr. Martin Luther King, Jr. to be displayed at the newly renovated ArtsPark at Young Circle in Historic Downtown Hollywood. Adult artists with bronze sculpting expertise are encouraged to apply. Artist teams are eligible to apply, including teams of artists from multiple disciplines. The artist will also provide a schematic design for the bust’s concrete base to include the incorporation of Dr. King’s “I Have A Dream” speech in its entirety. The project will be publicly displayed outdoors at the ArtsPark at Young Circle and provide a new platform of public art to facilitate community interaction of diverse populations. The maximum budget is $20,000. For Questions or an Application Please Call: Renée Jéan, Grants Manager, at 954-921-3201. 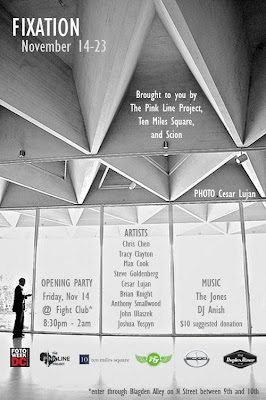 This Friday, November 14, from 8:30 pm - 2 am at the Fight Club (1250 9th Street, NW, enter through the rear in Blagden Alley, from N St., between 9th and 10th).